This batige 2 port HDMI wall plate mount help to wire your house cleanly and efficiently for audio/video. USB 3.0 port for data transit. You no longer have to resort to messy cables hanging out of an ugly hole in the wall. This wall mount is the perfect means for HDMI ports to remotely access HD displays or media sources. This face cover made to fit into standard wall mount holes, similar to an AC outlet or light switch. This batige dual HDMI wall plate outlet come with 6 screws, 2 long screws and 4 short screws,1 HDMI adapters,1 USB 3.0 adapter,easy to install. 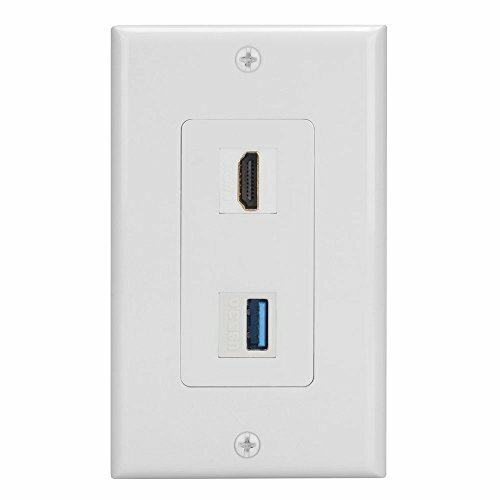 The practical design makes this wall plate an ideal solution for HDMI cable extensions for home or business locations.